Image process tool : AstroImageJ with my own macros, Fitswork, IrfanView. Processing : demosaic, one point aligned at center star, flat cal, no dark or bias, use dithering instead, median stack. Comment : Another night with clear sky and I still have the comet outside my balcony. Magnitude is now 12.9 according to CdC (Skychart). A 800 x 800 1:1 crop from full frame sensor. It's moving faster now because it's closer to the Earth, you see how elongated it is because of its speed. Comment : This comet wasn't easy to catch, weak, strong light pollution and low to the horizon. Magnitude 12.9 according to CdC (Skychart). 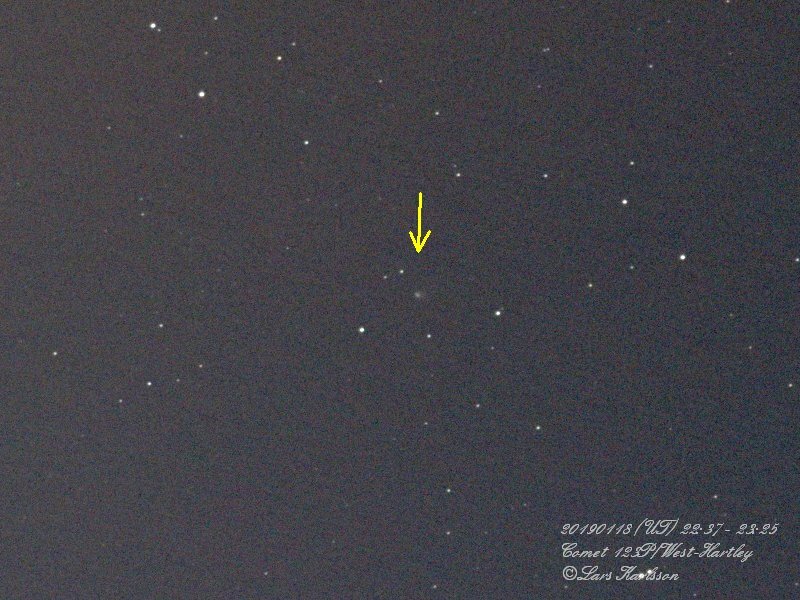 A 800 x 600 1:1 crop from full frame sensor, just outside the inner red circle below. 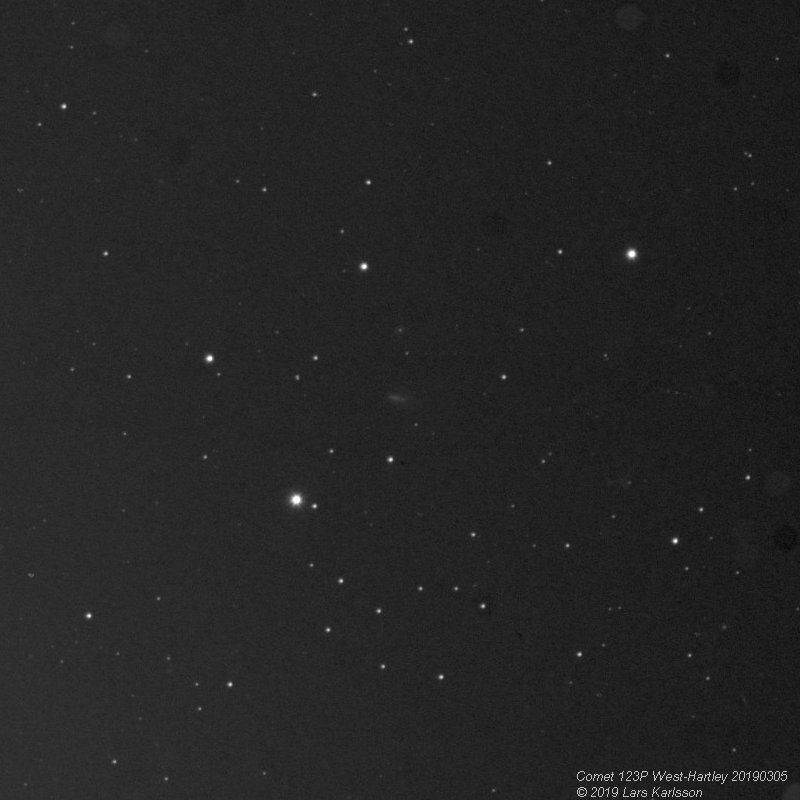 I must say that I'm surprised that it was possibly to catch this weak comet from my light polluted balcony. 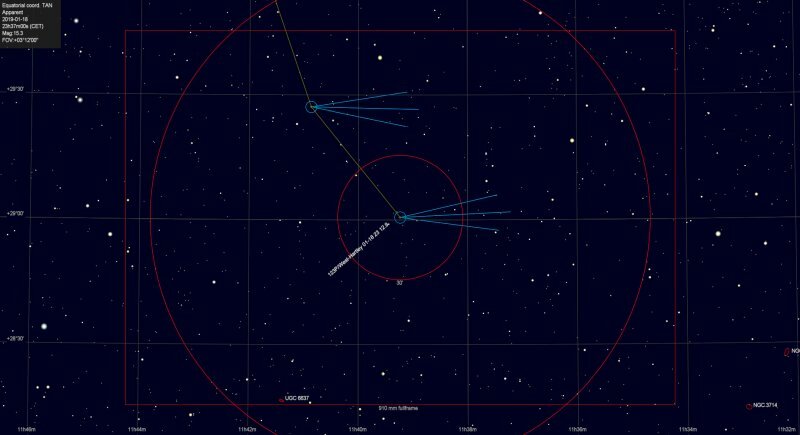 Comment : With the CdC (Skychart) software you can simulate and see where you find the comets. The inner red circle is 0.5 degree diameter, the outer is 2 degrees. The rectangle is the field with a fullframe sensor at focal length of 910 mm, about 2.2 x 1.5 degrees. 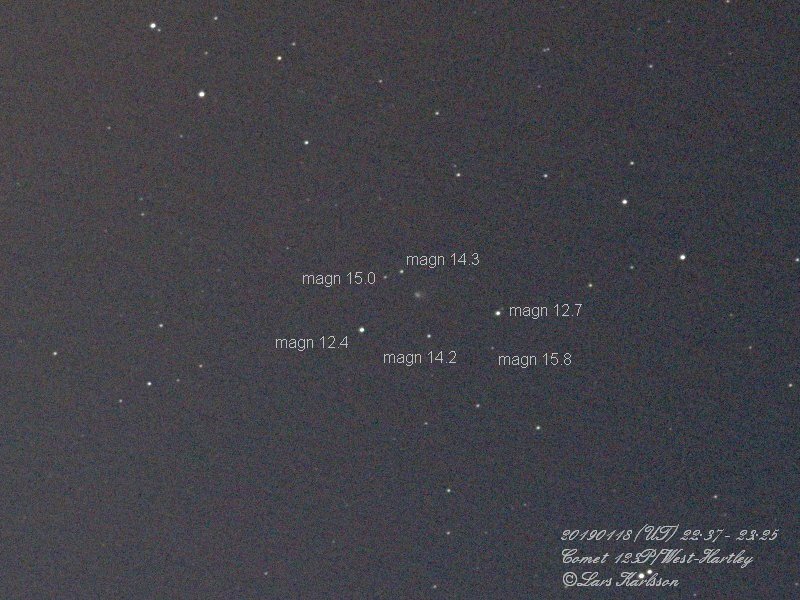 Comment : My friend Hans has provided the nearby star magnitudes as a comparison to the comet. Source APASS. Based on this, Hans estimates that the comet's magnitude is about 13. Thanks a lot Hans for the correction of my mistakes earlier!